They say in life it’s the things you don’t do that you regret the most. 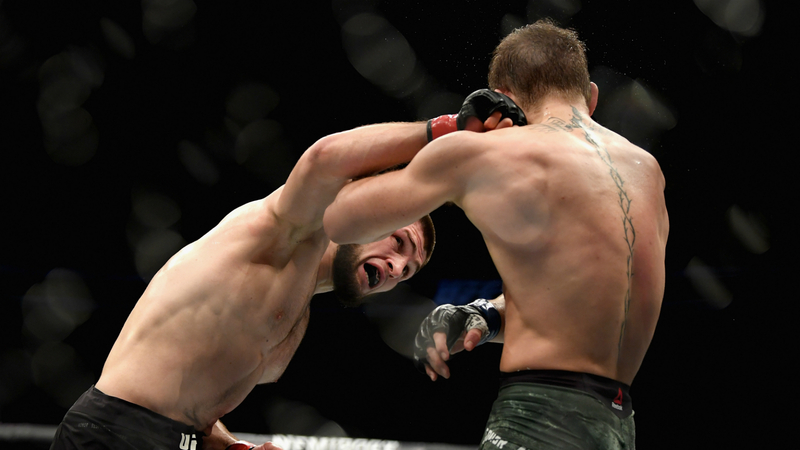 Those generally-wise words may ring true in most instances, but for Khabib Nurmagomedov there should be regret for something he did do after defeating Conor McGregor to complete the most famous victory of his mightily impressive MMA career. It should have been a moment of jubilant celebrations. McGregor, for all his typical pre-fight brashness and gusto, endured more misery in Las Vegas 14 months on from his defeat to Floyd Mayweather Jr. after dipping his toes into the boxing world. Make no mistake about it, Khabib dominated McGregor and made the big-talking Irishman eat his words after his vow to knock out a man who had never lost a round, let alone a fight, in the UFC. But the moment Khabib — aptly nicknamed “The Eagle” — decided to launch himself over the cage and soar towards McGregor’s trainer Dillon Danis, all of that changed. It sparked the first of two brawls, the second seeing two individuals enter the Octagon with worrying ease to aim punches at a worn-down McGregor. And thus, the ending to arguably the most hyped fight in UFC history was one that even WWE honcho Vince McMahon may have struggled to dream up. Such was the circus-like nature of the final act. Really the only thing missing from the farcical scenes was the musical sound of shattered glass to signal the arrival of “Stone Cold” Steve Austin, steel chair in tow, making the save before sharing a “Steveweiser” with a battered McGregor and hitting the “Stone Cold” stunner on the Irishman for good measure. Speaking afterwards, Khabib — whose share of the purse is being held by the Nevada State Athletic Commission — explained that emotions spilled over due to McGregor’s taunts. He may have posed the question, but Khabib knows full well why people are talking about him jumping over a cage, such unsavoury scenes inevitably draw intrigued eyes. The reality, though, is that it didn’t need to be this way. McGregor’s well-documented attack on a bus carrying Khabib at UFC 223, which landed him community service and mandatory anger management classes, meant the moral high ground was already with the Russian. But an eye for an eye makes the world blind and Khabib’s revenge act draws more eyes to UFC for the wrong reasons. It was simple. Khabib had earned the dominant win. He should have had his lightweight belt presented to him in the ring and walked away in the knowledge that he silenced McGregor’s trash talk. So, now what for Khabib? A suspension seems probable, being stripped of his lightweight belt not impossible, while he and the UFC have reputations in severe need of repairing. There is, of course, the legitimate argument that the scenes will benefit UFC. Everyone is talking about what happened in Vegas, many may be inclined to tune in to see what Khabib does next, McGregor’s legion of fans certainly will. A rematch could be in the offing. But is this really the way Dana White would want to go about showcasing the product? The images that marred the end of the fight will only serve to fuel the fire of those that treat UFC as boxing’s barbaric cousin and potentially turn any neutrals, watching due to McGregor’s uncanny ability to transcend MMA, away from the sport. UFC is already beaten with the stick by some that essentially what is on offer is an unscripted (at least in the ring) version of WWE. The short-term ramifications may be a boost, but long term this is a reputational hit the company will not welcome. Take nothing away from Khabib’s performance in the ring. It followed a familiar script of grappling brilliance to which McGregor, like everyone before him, had no answer. That the Irishman survived such a brutally brilliant exhibition of ground and pound in round two really is to his credit, but the truth is he was no match for Khabib. Unfortunately, such analysis of Khabib’s display will be little more than an afterthought.